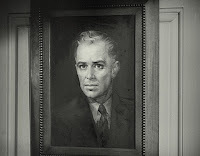 This essay is the second of two contributions Thrilling Days of Yesteryear is making to the March-in-March “Free-For-All”—a subsidiary of the same blogathon being hosted by Sittin’ on a Backyard Fence from March 15-31. For a list of the participants you are invited to click here; for the individuals contributing essays as part of Fence’s “guests” click here. 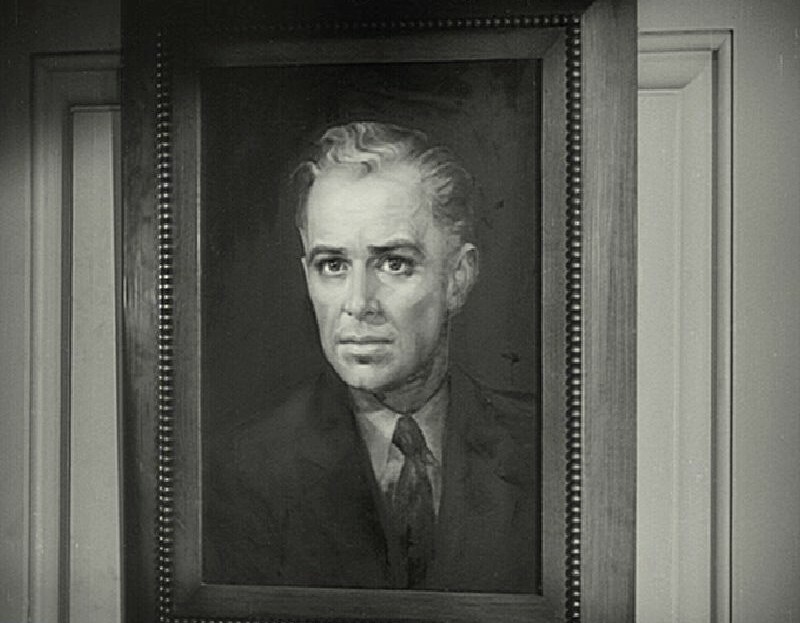 It’s a setting right out of Alfred Hitchcock’s Shadow of a Doubt: an idyllic American household presided over by university professor Mike Frame (Fredric March)—a research chemist who is working for the war effort on behalf of the U.S. Government. 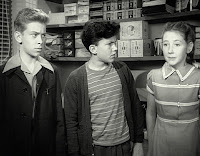 Mike has a precocious young daughter (Joan Carroll) named Pat who informally calls him by his first name (rather than “Dad” or “Pop”), and has been dating a charming and tres attractive schoolteacher (Betty Field) who answers to "Leona Richards." 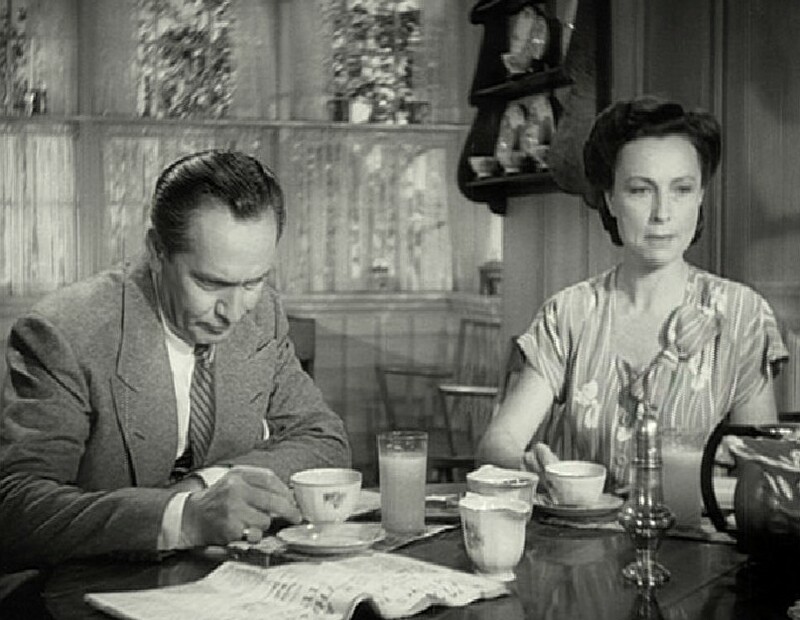 Also residing in the Frame household are Mike’s spinster sister Jessie (played by—who else—TDOY idol Agnes Moorehead), and the family’s German émigré domestic, Frieda (Edit Angold). Um…yeah…that’s a little awkward. And that’s when we learn through the course of watching Tomorrow, the World! (1944) that little Emil is a member of the Hitler Jugend (he’s even put on his uniform, which he cleverly concealed under the suit he wore for the trip) and that Prof. Mike is going to have his hands full drumming all that Third Reich nonsense out of the little turd. Emil is more than just a problem child—he parrots Nazi propaganda, denounces the memory of his father (a heroic man who died for his ideals and beliefs) and antagonizes nearly everyone he comes into contract with, whether it’s fomenting racial intolerance among his schoolmates or not even bothering to disguise his dislike for Leona, Frame’s Jewish fiancée. Tomorrow, the World (inspired by Adolf Hitler’s famous threat) was originally a Broadway play written by James Gow and Arnaud d’Usseau, running for 500 performances between April 14, 1943 and June 17, 1944, and its success prompted Lester Cowan to purchase the rights ($75,000 plus 25% of the gross) for a film version that was co-scripted by Academy Award-winning scribe Ring Lardner, Jr. (Considering that the theme of Tomorrow is tolerance, it’s wryly ironic that Lardner was later blacklisted in the industry as a member of the Hollywood Ten.) The direction of the film was assigned to Leslie Fenton, an actor-turned-director who’s perhaps best known for shorts (he directed a few of the Crime Does Not Pay shorts, including one reviewed here on the blog, 1938’s A Criminal is Born) and B-pics like Tell No Tales (1939). As a rule, child actors give me a rash—but I was pretty impressed with Homier in this film (I also enjoyed Carroll’s turn as Pat—a cute-but-never-cloying adolescent); the final scene where he breaks down in front of the family and admits that the Nazis have lied to him about his father (and also that he was tortured by those swine) is powerful stuff. If I have any reservations about his character it’s that he’s a little too much of a monster…sometimes his antics stretch believability a tad (and the reaction from some of the adults in the film is a little hard to swallow as well). 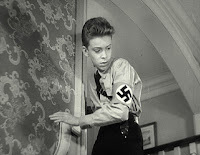 Little Emil’s severely retarded social skills reach an apex in one scene in which he obtains the silence of one of his classmates (a terrified-looking kid played by Patsy Anne Thompson) by threatening to have the Nazis dispose of her father (he’s a P.O.W. overseas). Actress Betty Field won the role of Leona away from the actress who essayed the part on stage: future Oscar winner Shirley Booth. 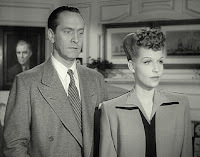 Now, I think Betty is quite striking in this film (which is odd, since Field herself never considered herself a beauty) but I thought her performance lacking a bit; she’s an exquisite china doll that doesn’t seem to have much of a core. Granted, the only movies I’ve seen Field in are at the end of her career (Picnic, Bus Stop, Birdman of Alcatraz, etc.) when she was certainly more practiced and pronounced in her craft but I’ve also seen Of Mice and Men and Shepherd of the Hills and I just wasn’t particularly wowed by her (clearly I need to have a second look). I won’t deny, however, that I am an Agnes Moorehead partisan and perhaps that’s colored my perception of Field’s performance; the truth is, Aggie acts rings around the gal (watch both of them in the scene in which Moorehead beats herself up for being taken in by the little creep and you’ll see what I mean) as the concerned aunt who develops an instant dislike of Emil but later is taken in by his insincerity because he’s able to play on her insecurity. 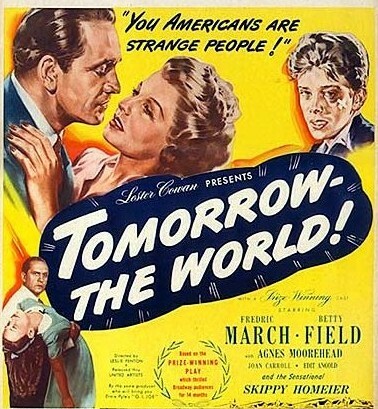 Tomorrow, the World! isn’t shown often on TV, and I think it’s because like yesterday’s So Ends Our Night, the surviving film elements are in a regretfully sorry state (it was not a studio film but a United Artists release) and restoration seems nigh impossible. 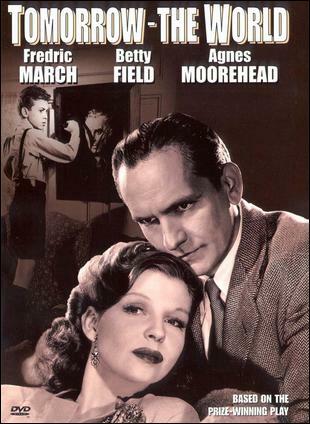 It has been released on VHS and DVD (the latter courtesy of Image Entertainment) but the print looks as if it’s been really through the ringer (though it is watchable), the running time of the film is also listed in various film directories as 86 minutes (the Image version runs 82, which suggests there might have been some snipping that is now lost). 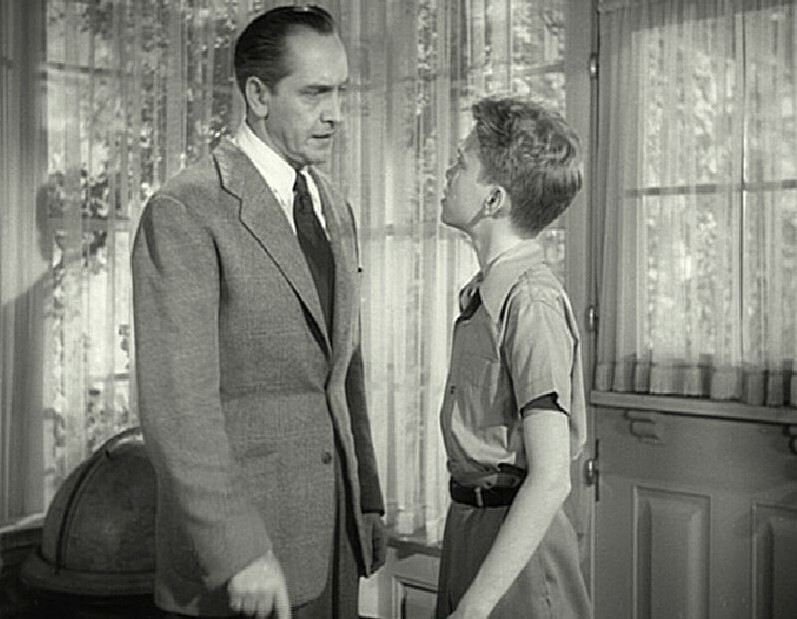 It’s a film that might not hold up well for modern audiences today—its blend of familial homily and pure dagnasty evil is admittedly jarring, and some of the takes that I’ve read from people who’ve seen the film question how a kid like Emil ever got into the U.S. to begin with. (That prompted me to look on the DVD case for the designation that read “documentary,” by the way.) 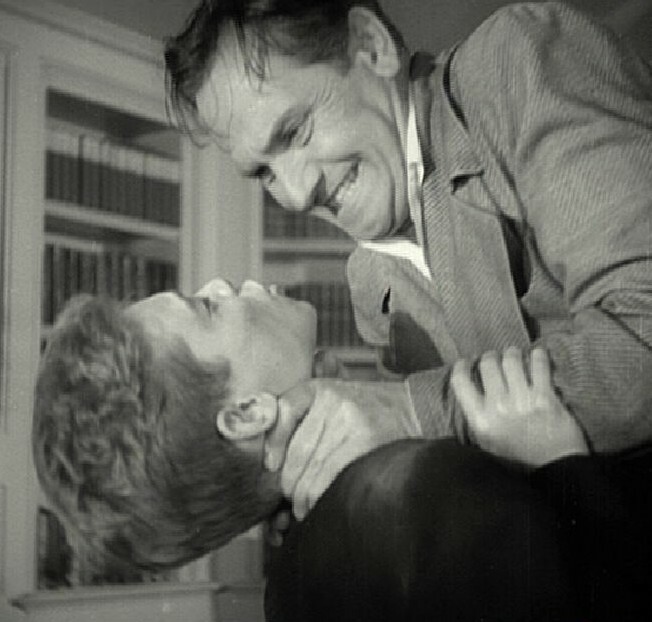 But it’s fascinating as an artifact of its era, a time when World War II inspired Hollywood to produce propaganda films to get audiences to identify with ordinary Germans like Hitler’s Children (1943) and The Seventh Cross (1944). And it’s one more notch on the cinematic holster of Fredric March, the two-time Academy Award winner who was the focus of this amazing blogathon, one in which I was only too happy to participate. I've managed to see both SO ENDS OUR NIGHT and TOMORROW THE WORLD, and they're fascinating glimpses into Hollywood's portrayal of the Nazi threat, both in Europe and right here in the good ol' USA. Like you, I thought Homier's performance in the latter film was remarkable, considering his youth, but thought the characters as a whole were a little too symbolic ('decent' Americans vs. 'nasty' Nazis). 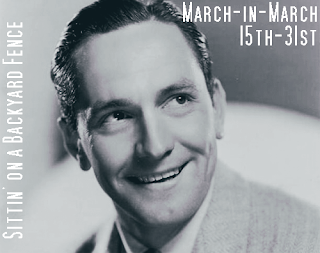 However, both films offered interesting opportunities for March beyond conventional leading-man roles. 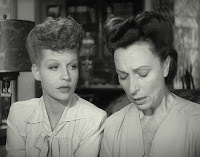 They're also great, unconventional choices for the March blogathon; thanks for highlighting them!